Caryl Levine and Ken Lee have over 20 years of experience running the exotic rice company Lotus Foods, and in that time the pair have cultivated an award-winning value chain engagement system that raises farmer wages while also reducing on-farm methane emissions. Learn more about their story in this interview, the first in a series of advice from leaders within the climate action sphere. 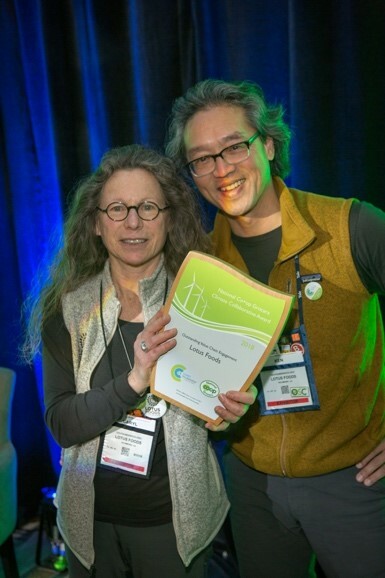 Our first interview is with Caryl Levine and Ken Lee, Co-Founders and Co-CEOs of Lotus Foods, winner of the 2018 National Co+op Grocers Climate Collaborative award for Outstanding Value Chain Engagement. Lotus Foods won this award for their work creating market incentives and supply chains for pioneering, small-scale farmers using the More Crop Per Drop™ rice production method, which is raising farmer wages and outputs while reducing on-farm methane emissions by 40%. Q: Thanks for taking the time to share your story with us, Caryl and Ken. Could you begin by telling us about the impact the More Crop Per Drop™ project has had on Lotus Foods’ work, internally and externally? A: Lotus Foods made the commitment to working with farmers using System of Rice Intensification/More Crop Per Drop™ practices ten years ago. This agro-ecological method for growing rice enables farmers to increase their yields while using less water, emitting less methane gas into the atmosphere, and making rice growing less arduous and unsafe for women. We are very proud of our persistence in linking these pioneering farmers to an international market, despite what have sometimes felt like insurmountable challenges—like establishing supply chains in four countries with partners and farmers who had absolutely no prior experience in marketing or exporting rice. Nor did they have access to equipment or credit that could smooth the path. These were countries where Lotus Foods had not worked previously either, but amazingly, we made it happen. The recognition from the Climate Collaborative and National Co+op Grocers (NCG) through this award is super important to Lotus Foods and what we are trying to accomplish—the Climate Collaborative being a new entity that is mobilizing the industry and NCG being one of our most valued and important retail channels. Q: That’s terrific to hear–it’s a well-deserved award! So, there are lots of ways for a business to reduce its carbon footprint. How did you decide what to prioritize? A: Initially, our priority was to create incentives for farmers to use less water, given accelerating concerns around water scarcity and the heavy demand rice makes on freshwater resources. However, over the past decade there has been a rapidly growing body of research on the reduction in methane emissions when rice is grown on unflooded fields—similar to how crops like wheat and cereals are grown. Contrary to popular belief rice is not an aquatic plant. It can adapt itself to flooded conditions, as that’s how it has traditionally been grown, but it doesn’t actually thrive in those conditions, as evidenced by the higher yields experienced with System of Rice Intensification (SRI) and our More Crop Per DropTM practices that encourage less water usage. Based on research data, we estimate that our farmers are cutting methane emissions from their fields by about 40%. Project Drawdown estimates that if SRI could be widely scaled by 2050, it would result in a savings of about 3 gigatons of carbon dioxide equivalent. At the same time, it would generate an additional production of about 477 million tons of rice, earning farmers an additional $678 billion in profit. Promoting organic rice growing also reduces the use of fossil fuel-based fertilizers and pesticides which increase emissions of nitrous oxide, a GHG that’s even more potent than methane. Q: What inspires you to pursue climate leadership? Was there a defining moment, experience or realization you can share that really crystalized this direction for you? It was a moral imperative, knowing what we did about the importance of rice as the basic food for half the world’s population and that growing the global rice crop uses up to one-third of our planet’s annual supply of fresh water. Although we’re a small company and we can only be a drop in the bucket in terms of reducing global methane emissions, we feel we have played an outsized role in raising red flags around the environmental and social problems associated with current rice production. Q: We would agree! Would you share some of your vision for the future of climate action in the natural foods industry? A: Given our efforts from the get-go to be very proactive in terms of education and outreach to consumers and stakeholders in the natural products industry, we’d love to work collaboratively with other companies on the policy front. We already belong to the OSC2 CEO group and that could be a logical platform for brainstorming around what we can do collectively to throw our weight behind climate-friendly policies, whether in the upcoming Farm Bill, state initiatives or other arenas. We’d also like to raise awareness around the role of women in agricultural supply chains and how climate change impacts them. At the moment, we’re excited to be part of the pilot to test standards around the new Regenerative Organic Certification. We need to continue to raise the bar around the impact of agriculture on people, animals and the environment. On a consumer and retailer front we’d also like to partner more with NCG on educational programs. It would be very powerful to educate consumers and grocery store staff on our climate mitigation efforts and those of similar brands. These stories could inspire and provide guidance to consumers and team members on how best to support these efforts with purchases and other actions. Q: What advice would you give to other companies who hope to have a similarly positive impact? A: We’re a pretty mature company at this stage—over 20 years old. From our vantage point, based on what we’ve seen at trade shows and in our interactions at industry events, the new generation of companies in the natural products space already shares our mindset. They are motivated by a passion to make a difference in the lives of producers and protect the environment. Increasingly, technology is evolving to help companies measure their impact on greenhouse gas emissions and make that impact more transparent. As always, though, it comes down to believing in the importance of what you’re doing and being prepared to sacrifice time and money to pursue your goals and values. This article is the first in an eight-part series of interviews conducted by The Climate Collaborative.